From jobs numbers to earnings to GDP to an FOMC meeting, a lot is going on next week. Christina Scotti reports. The January jobs report, a Federal Reserve policy statement and several high-profile earnings reports will all vie for investors’ attention next week on a busy calendar of economic data. The January jobs report due Friday morning may be the highest priority as investors look for slowly strengthening labor markets to gain some much-needed momentum. The unemployment rate stood unchanged at 7.8% in December and November, not a great number but the best it’s been in four years. Job growth has been pretty much stagnant at about 150,000-160,000 gained per month for the past year. Economists are predicting 168,000 new jobs were created in January, up from 155,000 in December, and the unemployment rate is expected to be unchanged. In some good news received this week, the number of Americans seeking first-time unemployment benefits fell to its lowest mark in five years. The Federal Reserve Board will meet Tuesday and Wednesday and the Federal Open Market Committee (FOMC), which sets most Fed policy, will release a statement at the conclusion of Wednesday’s meeting. The Fed is expected to update its economic forecast as usual, but significant policy changes aren’t likely. The FOMC was busy late in 2012, announcing new bond buying programs and setting targets for when fiscal policy may start tightening. But not much has changed in the past month so nothing extraordinary is expected following this month’s FOMC meeting. 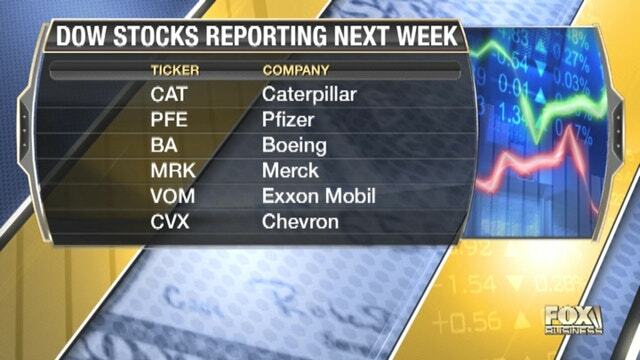 Bellwether companies reporting earnings next week include: Caterpillar (NYSE:CAT) and Seagate Technology (NYSE:STX) on Monday; Amazon.com (NASDAQ:AMZN) and Pfizer (NYSE:PFE) on Tuesday; Boeing (NYSE:BA) and Facebook (NASDAQ:FB) on Wednesday; and ExxonMobil (NYSE:XOM) and Merck (NYSE:MRK) on Friday. Boeing, in particular, will be closely watched given the airplane makers’ recent troubles with its grounded 787 Dreamliner model. Investors will get their first preview of fourth-quarter gross domestic product on Wednesday and the forecasts aren’t very good. On the housing front, a report on pending home sales is due Monday and the S&P Case Shiller Home Price Index is out Tuesday.